The recent one week old earthquake of magnitude above eight shattered the myth of human development and once again has exposed the human bleakness against the nature. 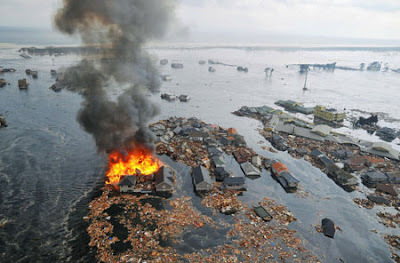 The Japan right now is facing many problems as the aftermath of this disastrous quake, on one side it is facing massive loss of life and property and nuclear radiation as one after other four of its nuclear reactors are radiating enormously at dangerous levels, whereas after this much destruction the manufacturers are feeling too hard to keep their production to pre-earthquake levels. Worst effected are the technology firms as they are facing with shortage of supplies in the wake of earthquake. Japan houses many of the world’s largest tech manufacturing companies. Many of the companies have even stop their productions as they are not rational in this situation and carrying out the safety checkout and the chances of frequent blackouts are inevitable after nuclear reactors blast. The company that has been affected in this situation are Sony, Panasonic, Toshiba and Canon. Panasonic Corporation did not carry out its safety checks at its units in northern Japan Sony too voluntarily has suspended its operations at seven manufacturing plants in Japan due to unasserted state of its power grid. The company's Sendai Technology Centre in Tagajo, Miyagi Prefecture has also been closed due to earthquake damage. Shin-Etsu Chemical, which makes the silicon wafers as used in semiconductors, has shut down production at three of its factories. Toshiba, the producer of a third of the world's NAND memory chips as used in Apple's iPad and other such devices too trying to restart production at its units. Sub sea internet cables around Japan Damage to sub sea cables could have disrupted the global internet as well. Three of Canon units that prepare LCD screens, lenses and inkjet printers too are affected in this quake. The seas around Japan are known as a junction for the undersea telecoms cables that make an integral section to the global internet.